The Blue Angels flying in formation. The Blue Angels are a group of special pilots who work for the US Navy. They fly F/A-18 fighter jet airplanes that are painted to look different from regular Navy planes. They are very famous. Almost every American has heard of them. The pilots of the Blue Angels are very good at what they do. They are able to fly very close to each other and do very difficult tricks. They are most famous for the flyovers they do at many American sporting events. Wikimedia Commons has media related to Blue Angels. 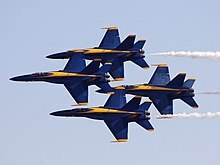 Explore the Navy: Blue Angels official website. This page was last changed on 9 March 2015, at 03:37.